Venezuelan President Nicolas Maduro on Sunday vowed that they "will finally win" and his country would survive the “coup attempt”. In an interview with Turkish private broadcaster CNN Turk, Maduro stressed that his country has no political and diplomatic relations with the U.S. and described Secretary of State Mike Pompeo's remarks at the United Nations Security Council (UNSC) as "the words of a falling country". "Mr. Pompeo is a spokesman for the country that threatens us. However, the power of the country we are talking about is in decline. There are new strong countries and leaders in the world. There are countries economically and politically developed," he said. On Saturday, Pompeo had called on the UN Security Council to recognize Venezuelan opposition leader Juan Guaido as the legitimate leader of the country. "[Pompeo] doesn't respect anyone and thinks he can rule by shouting and threatening. No one can shout at us. He can say what he wants about me, but I protect my country, my people and my history. The Turkish people will see that we will finally win. We're going to survive this coup attempt," the Venezuelan president said. On Wednesday, following mass demonstrations throughout the country, Gauido, president of the Venezuelan National Assembly, announced President Nicolas Maduro as illegitimate and declared himself as the interim president. At least 20 people have died in the protests, according to the UN High Commissioner for Human Rights. Soon after, U.S. President Donald Trump put out a statement recognizing Guaido as the president of the country. Argentina, Canada, Chile, Colombia, Costa Rica, Ecuador, Guatemala, Panama and Paraguay have followed suit while Bolivia and Mexico continue to recognize Maduro. Russia and China both opposed the U.S. call to support Guaido, and condemned any international interference in the affairs of Venezuela. Turkey and Iran have put their weight behind incumbent President Maduro. Maduro said the U.S. President Donald Trump is not a leader who can deal with the problems and underlined that Trump “belittles” Venezuela, Latin America and the world. "He belittled the whole world and as a Latin American, I can say that he hates us. 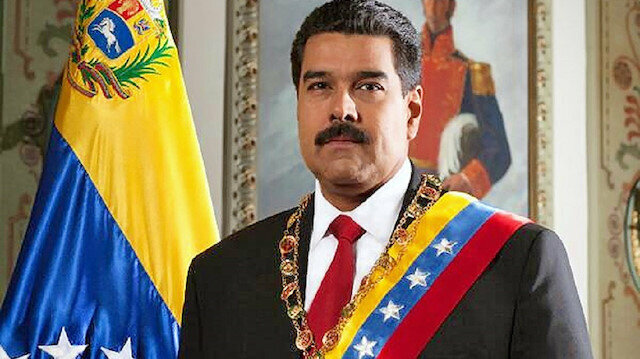 This is unacceptable because there is no room for racism and hate in today’s world," Maduro said. Pointing out that his country has been under many financial and economic attacks, Maduro vowed to overcome hyper-inflation in 2019. "We are going through a historical war for Venezuela, for our democracy and independence," Maduro said, and accused the U.S. of the recent crises in his country. "They [the U.S.] attack us thinking that Venezuela is their own backyard," he said. Maduro said his country is a victim of the ongoing attacks and the U.S. Presidents George W. Bush, Barack Obama and Donald Trump all targeted Venezuela. "We have been attacked since [former President Hugo] Chavez's death," he said, stressing things has gone worse during the Trump Administration. Maduro accused the U.S. of attacking on Venezuela and planning a coup attempt in the country. "The American news agencies and The Washington Post reported on January 22 that this coup attempt order had been given to Guaido by Trump himself,” Maduro said. The Venezuelan president said he was initially unaware of July 2016 defeated coup in Turkey -- organized by Fetullah Terrorist Organization (FETÖ) -- and added he saw photographs of people on the streets. “When I learned about the coup attempt and saw photos of the nation defending their homeland, I immediately told my foreign minister to condemn this attack,” he said. FETÖ and its U.S.-based leader Fetullah Gulen orchestrated the defeated coup of July 15, 2016 in Turkey, which left 251 people martyred and nearly 2,200 injured. Maduro also noted that the western media portrayed the coup attempt as “something good” for Turkey, and they opposed Erdoğan. “Since that day we’ve been friends with Mr. Erdoğan,” he said, adding that he loves Turkish people. “Turkey has a very important and beautiful history. Maduro stated that they are going to overcome the problem in his country with laws and justice, and added he is “open for dialogue”. Highlighting that Guaido violated the constitution, he said, however, he was not a jury and the issue would be solved in accordance with the law. On some European countries’ statements which say they will recognize Guaido as Venezuela’s acting president if elections are not announced soon, Maduro said Europe was “again making a mistake”. “Europeans were arrogant in this process. They should take back this ultimatum. No one can give us an ultimatum,” he said. Recalling last year’s presidential elections in his country, Maduro said he won the election with 65 percent of votes, and the parliamentary elections were going to be held in 2020. He said Venezuela’s electoral system is quite modern and that they use the national observer system. Maduro noted the diplomatic staff of the U.S. Embassy in Caracas had left his country, however, the both sides agreed to continue negotiations for the protection of officials in the two countries. For that reason, a small group of the U.S. and Venezuelan diplomats were present in each other’s countries to take part in 30-day negotiations, he added. Following Trump’s recognition of Guaido as president of the country on Wednesday, Maduro had quickly shot back, cutting off diplomatic relations with Washington and giving U.S. diplomats 72 hours to leave the country. Turkish opposition party leader strongly on Sunday condemned U.S. President Donald Trump's “coup attempt” against Venezuelan president.“I strongly condemn Trump’s coup attempt against [Venezuelan President Nicolas] Maduro and I hope Venezuela survives this hardship without being dragged into civil war conditions,” Devlet Bahceli, head of opposition Nationalist Movement Party (MHP), said at his party’s group dinner in Istanbul.“To resist the oppressor means to stand with the right and truth,” Bahceli said.“It is my wish that Maduro does not surrender, bow down, and fall into the captivity of imperialism,” he went on to say.Venezuela has been rocked by protests since Jan. 10 when President Nicolas Maduro was sworn in for a second term following a vote boycott by the opposition.On Wednesday, Juan Guaido, the leader of Venezuela’s opposition-led National Assembly, declared himself acting president.U.S. President Donald Trump recognized Guaido as president of the country.Argentina, Canada, Chile, Colombia, Costa Rica, Ecuador, Guatemala, Panama and Paraguay have followed suit while Bolivia and Mexico continue to recognize Maduro.Russia and China both opposed the U.S. call to support Guaido, and condemned any international interference in the affairs of Venezuela. Turkey and Iran have also put their weight behind Maduro. Israel on Sunday recognized Venezuelan opposition leader Juan Guaido as the acting president of the South American country. "Israel joins the United States, Canada, most of the countries of Latin America and countries in Europe in recognizing the new leadership in Venezuela," Israeli Prime Minister Benjamin Netanyahu said in a tweet.Venezuela has been rocked by protests since Jan. 10 when President Nicholas Maduro was sworn in for a second term following a vote boycott by the opposition.On Wednesday, Guaido, the leader of Venezuela’s opposition-led National Assembly, declared himself acting president.U.S. President Donald Trump recognized Guaido as president of the country.Maduro quickly shot back, cutting off diplomatic relations with Washington and giving U.S. diplomats 72 hours to leave the country.He has repeatedly lashed out at the U.S., saying Washington is waging an economic war against him and his government amid a sweeping sanctions campaign.Brazil and the Organization of American States recognized Guaido as Venezuela's leader prior to his formal announcement. Argentina, Canada, Chile, Colombia, Costa Rica, Ecuador, Guatemala, Panama and Paraguay have followed suit while Bolivia and Mexico continue to recognize Maduro.Several South American countries, Russia, Turkey, China and Iran have also expressed solidarity with Maduro.European heavyweights -- including the U.K., Germany, France and Spain -- took a similar stance against Venezuela's elected president and called on Maduro to announce fresh elections within next eight days to ease the current political crisis in the south American nation.